After Megaman 3, the eight Robot Masters Shadowman, Spark Chan, Geminiman, Snakeman, Topman, Hardman, Needlegal, and Magnetman decided to become superheroes more out of boredom than anything else. They called their team the Mechanical Maniacs! After fighting long and hard the Mechanical Maniacs were made officially sanctioned members of the Robot Police and are in direct contact with Dr. Light and Megaman. The stress of a battle with a new foe called Mesmerman and the breakup of longtime friends the Sinister Six due to the death of Iceman has caused a toll on Magnetman (Jonathan S.) and he quit shortly after these traumatic events. 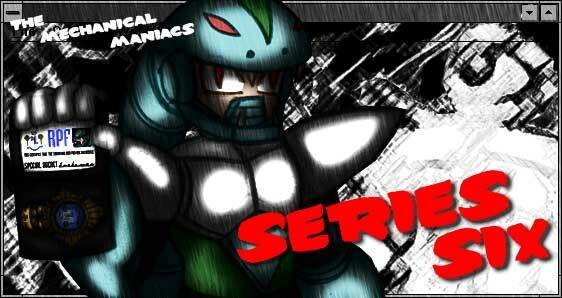 However, all is not dark as these same events inspired Dr. Light to study and upgrade the 'Maniac's armor into new "Transmetal 2" forms. 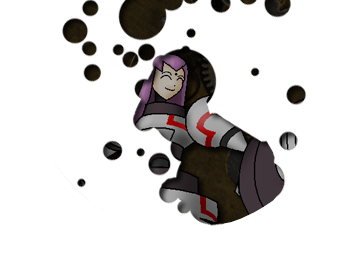 These forms have unique powers and abilities that have barely been tested by the remaining Mechanical Maniacs. But with that new status came new enemies. Longtime foes like Bizarro Shadowman, Galvatron, and even Xelloss were no longer a concern, but that left new enemies to rise up from the woodwork. Long thought dead Megaman Juno returned as the mysterious Hakushaku and made his own evil robots. The villainous Quarter Knights have two surviving members and one dangerious entity they created now trapped by the team. And a misguided experiment by Topman created another twisted douple - Nightmare Top. With enemies coming out of the woodwork the team must work harder than ever before to keep the peace.